Makapu’u Lighthouse Trail – Easy Hike in Hawaii with great views of O‘ahu’s southeastern coastline. This easy hike in Hawaii is great for families, as the road is paved and you can hike there with a stroller as well. It takes about 30-40 minutes to the top. The round trip is 1.5 miles long, about 2.4 kilometers. A great hike for families with kids! From December to April, you can be lucky and watch whales here as well. If you want to be even closer to the Whales, check out the Whale watching tours during the Whale season in Hawaii. On the way to the lighthouse, there are several platforms where you can sit down and enjoy a great view. In the middle of the path you can watch people climbing down to small pools – but the way is very steep and exhausting. Arriving at the end of the path, you will have a fantastic view of the lighthouse and the entire east coast. On a beautiful day, you can also see other islands. 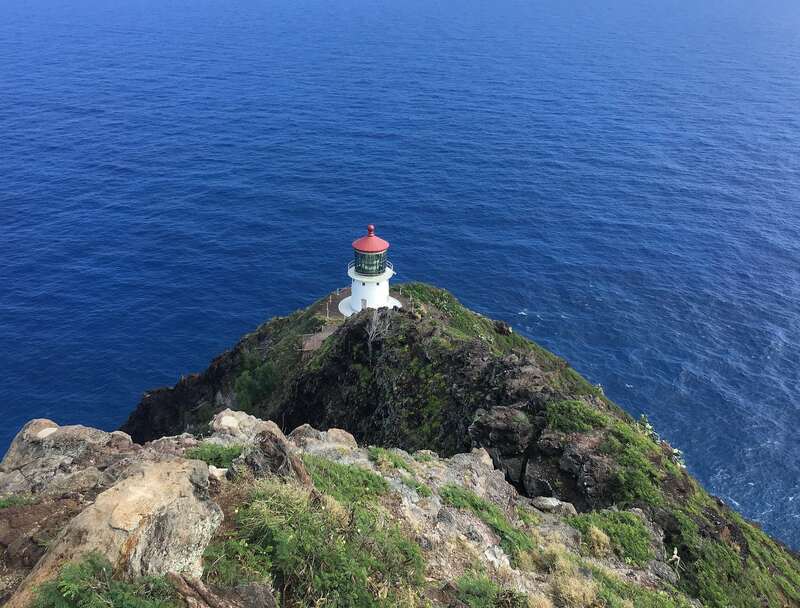 The lighthouse is the southeastern point on Oahu. If you do not want to hike, but still want to enjoy the great view, you can continue driving and stop at Makapu’u Lookout. This is also a stop on our Oahu tours. The Lookout overlooks Rabbit Island, Makapu’u Beach Park and Waimanalo Beach. Rabbit Island is called Rabbit Island because locals say it looks like a rabbit. Makapu’u Beach Park is located next to the lookout and is one of my favorite beaches on the island. Waimanalo Beach has been voted the most beautiful beach in the US and in order to unique and beautiful, tours are not allowed to stay on this beach. I recommend to hike in the morning or in the late afternoon due to the high temperatures. This is a nice and easy trail perfect for families with kids. More info about Hawaii? Follow us on Facebook!